We’re pretty obsessed with jeans here at Express. We’re obsessed with how they look, how they feel, how they wear. We love stitching and shape, color and fit. We love these things so much we have a whole design team dedicated just to denim, and they’ve been working overtime. Because we’ve been releasing some of our favorite styles over the past few weeks, we wanted to give you a little peek behind the denim curtain and introduce you to the woman who makes all our jean dreams come true. 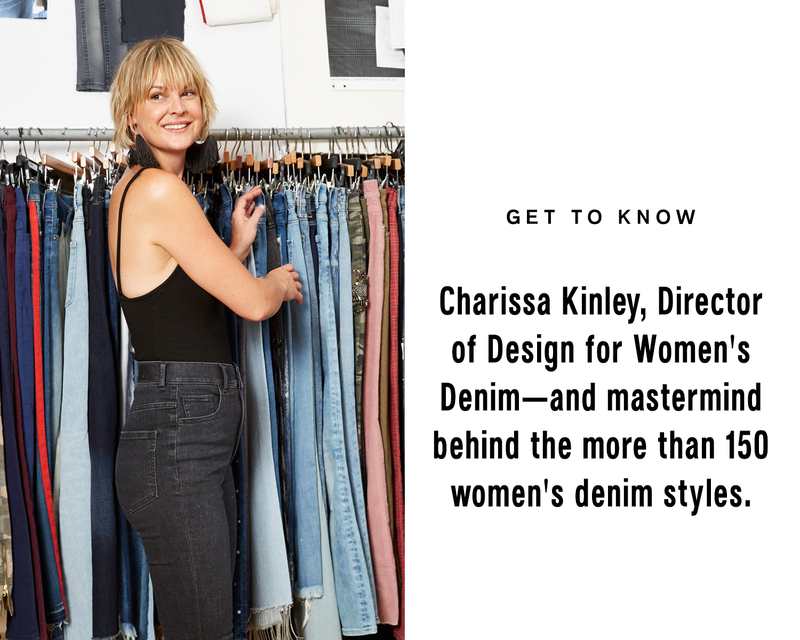 Meet Charissa Kinley, Director of Design for Women’s Denim, and truly one of the coolest gals in New York City (a high bar!). Whether she’s working some high-waisted denim and an off-the-shoulder top or conducting an international hunt for the perfect vintage wash to try out, Charissa’s our go-to source for all things jeans. So, as an introduction to our Behind the Seams series, we talked to the Iowa native about all the elements of good denim, her favorite pair of jeans, and how to find your perfect pair. EXPRESS: When people think of designers, they think of people sketching by hand. Is that how you design EXPRESS denim? Charissa Kinley: A lot of work is done on Illustrator, but a lot of what we do is around wash and patterns. We’re constantly being inspired. We’ll take a whisker pattern from a pair of vintage jeans and add a hole here, or a treatment there. Most of the designing is also building the silhouette with our tech team. Right now, we currently offer four leg shapes [legging, super skinny, skinny, barely boot] and eleven washes in Denim Perfect and 16 different leg shapes altogether, so it’s a pretty big range. What are your favorite jeans you’ve designed so far? Honestly, Denim Perfect. I love it. It holds you in, but it’s stretchy and still comfortable. It’s a marriage between the fabric being the right fabric and the fit being the right shape…and it’s high-rise. I love high rise. The perfect pair of jeans makes you feel good. These go the extra mile. Which jeans are you wearing now? What do you love most about them? I love our Vintage-inspired fits, but our High-Waisted Straight Crop is my favorite! I’m feeling super high rises and easier leg silhouettes. What advice do you have for people who are trying to find the perfect fit? The most important attribute of the perfect fitting jean is how it makes you feel. To me this means it hugs you in all the right places, but not too tight (especially at the waistband, there is nothing cute about muffin top). Jeans should feel comfortable and flattering. That’s what I love about Denim Perfect! The first thing I look at is my derrière — we engineer the back pockets on all EXPRESS jeans to flatter your best attribute. I also always do what I call the “the jean dance” which consists of a kick of one leg, then the other, then a quick squat to get everything positioned and I am on my way. I especially do that with our vintage-inspired jeans, which are lower stretch, because they kind of mold to your body. They really get better with wear. What are you working on now? What do we have to be excited about coming down the pipeline this winter or in to spring? Currently we are working on Spring 2019. We have a lot of new silhouettes coming that I’m very excited about! It’s all about higher rises and easier silhouettes! In holiday we have some amazing novelty in black denim. We also have very cool vegan leather and suede leggings that are perfect for holiday parties. What specifically drew you to denim? Denim is the most amazing blank canvas a designer can work with. You can drape silk and make it look beautiful, but you can do a million different things with denim. Whether it’s through wash, or a silhouette — it’s such an amazing and tactile fabric. It requires a lot of skill. The technicians behind creating each garment are so talented. Each pair of jeans is hand-crafted. The whisker pattern, when they sand the thigh — a lot of what makes denim look the way it does is all done by hand. That’s a good point. You can make every type of garment—tops, bottoms, dresses—out of denim. Yeah, right now denim is just having such a moment that we have seen since the ‘70s. I draw a lot of inspiration from vintage jeans. What do you think the lesson is for anyone who’s reading this? There’s something to be said about serendipity, not just with your career path but with life. I was really open to opportunity and to the idea that you have to allow for opportunities to happen. Eventually something might happen that’s totally life-changing.